Here and there we see many initiatives promoting the commons in different fields (free culture, open educational resources, seed banks, “reclaim the city”). However, only a few have reached critical mass and are well known by multiple communities; the majority remain in their social silos and political niches, more or less ignored by the mainstream. Yet we all know about people out there who would love to get involved in helping improve the world. They just don’t know which initiatives to help, and how to locate them. From the outside, it can be difficult to have a clear view of the ones available. So what happens, typically, is that people end up helping those large non-governmental organizations that have enough resources to pay for ads and marketing. The local, small initiatives, even ones with enormous potential, remain in the shadows because they cannot be easily found. Move Commons is a Web tool that seeks to change this situation. It aims to boost the visibility of such smaller social initiatives while building a network of related initiatives across the world. As the developers of this Web tool, we strongly believe it can foster mutual discovery, facilitate new projects, and help various movements to reach critical mass. Move Commons helps initiatives, collectives, NGOs, non-profits and social movements to publicly announce their core principles through a mechanism similar to the one used by Creative Commons (CC).1 Creative Commons allows authors to “label” their cultural works using icons representing a specific legal license. Move Commons provides a set of “labels” for social initiatives using a user-friendly, bottom-up system. The labels consist of four icons, together with a complementary set of keywords (such as its field of activism, research topics, geographical location, etc.). Like the CC licenses, Move Commons icons use RDFa tags – a set of metadata protocols – to facilitate Web searches that can locate projects and organizations. Projects can choose Move Commons “badges” that accurately describe the character of their activities, and place the generated logo (a combination of four icons) on their Web pages. Websurfers who reach a homepage with the icons can then see at a glance the general character of the initiative. The icons answer several questions: Is this initiative nonprofit? Is it transparent? Can I use part of their contents for my blog? How are they organized internally? Do they fortify the Commons with their actions? When you generate the badge for your Web page, Move Commons not only provides you with some easy-to-understand icons, it also gives you some machine-readable “semantic code” containing the information you provided, which you then place on your Website.2This allows search engines to identify and “understand” the Web pages that have Move Commons badges, enabling searches such as, “Which initiatives exist in Cairo that are grassroots organizations, nonprofit, delivering Creative Commons content, and related to ‘environmental education’ and ‘children’?” (Or substitute your own favorite social concerns, keywords and places.) If your initiative fits that description, the Move Commons semantic code would allow your webpages to be located and appear in the results. This capacity lets projects locate and collaborate with like-minded initiatives anywhere in the world. Potential volunteers can easily find an initiative that interests them even if the initiative is small and unable to market themselves widely. Non-Profit means that your initiative is a not-for-profit initiative. Reproducible means that you make it easy for anyone to clone your initiative. You are documenting your own processes and sharing your contents for others to use. Thus, you are facilitating others to follow your path and avoid problems that have already been solved. Grassroots means that your initiative’s governance tries to be as horizontal as possible. That is, hierarchical structure is minimal or nonexistent, allowing horizontal grassroots discussions to have a major weight in the decision-making as opposed to relying upon “vertical” instructions from a board. Move Commons is a self-labeling system where initiatives choose the icons/categories that they believe they comply with. This is certainly different from systems in which centralized institutions issue formal certifications. Such systems rely on the fact that the users must trust blindly the single certification issuer, which theoretically guarantees the accuracy and validity of the certifications, e.g., guaranteeing the nonprofit status of a foundation. However, there are multiple possible problems with the trustworthiness and legitimacy of these institutions. Within the Move Commons ecosystem, initiatives are the ones that self-assign and self-certify their categories, and thus there is no “centralized certification issuer.” This means that there might be initiatives that choose incorrect categories to describe themselves (either by mistake or on purpose), e.g., advertising themselves as “grassroots” when they are not. Optimally, there should be clear criteria for each category, together with a process of crowd-validation by the community.3 Thus, initiatives with controversial or incorrect icons would receive growing pressure to change them. Such processes would be independent services built on top of the open infrastructure. The basic Move Commons layer wouldn’t include any validation, allowing flexibility for multiple solutions implemented by third parties. The Move Commons labels aim to make collectives consider their missions and push them towards the ideals behind the four labels. It hopes to trigger such questions as, “How could we be reproducible?” “What should/can we do to contribute to the Commons?” “Are we horizontal enough to be considered grassroots? Why not?” The labels promote the discovery of small, local groups and encourage volunteers to work for projects that fit their passions, and not just those that are large and well-marketed. Most importantly, volunteers and donors can discover that “they are not alone” – a common problem in small initiatives that do not have the time or resources to learn about other, similar initiatives. Move Commons labels can help groups reach critical mass, reduce the duplication of efforts, share their mistakes and successes, and become part of larger networks of activism, even at the international level. 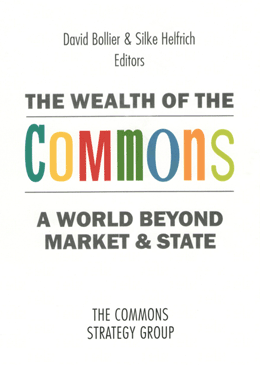 The driving force behind Move Commons is a few volunteers backed up by the Comunes collective (at http://comunes.org), a nonprofit organization focused on facilitating the work of other collectives and activists through the development of free/libre tools, with the aim of encouraging the commons. By the end of 2011 Move Commons was in the alpha stage of development. We have plans to improve the form for creating the badges,4 e.g., adding new optional fields for the semantic code5 and developing a Move Commons-compatible search engine. Once these are ready, third parties would be able to build additional services on top of the network of MC-labeled initiatives. These might include the aforementioned crowd-validation, recommender systems of initiatives, geographical mapping, network visualization, web widgets and others. In fact, Move Commons is fully decentralized so anyone could generate MC badges, and any search engine can track the semantic code, so we would not become a centralized node. This is essential for commons on open digital platforms. 1. Mike Linksvayer’s essay on Creative Commons licenses in Part 4. 2. “Semantic code” is metadata that is embedded into webpages to facilitate machine-readable searching and organization of information, enabling Web users to perform information-retrieval tasks in faster and more intelligent ways. 3. A proposed solution can be found in “The Evolution of Reputation,” chapter 5 of Rheingold, H. 2002. Smart Mobs: The Next Social Revolution. Basic Books. Javier de la Cueva (Spain) is a practicing lawyer. He has handled the defense for Ladinamo (the first ruling ever to acknowledge Copyleft) and Sharemula (which confirmed that websites offering links to P2P networks do not infringe on intellectual property). He participates actively in Medialab-Prado Commons Lab. He is a Sysadm; writes his scripts in Python; and is an intellectual property lecturer. Bastien Guerry (France) is a French free software activist. He currently works on exploring new digital experiences for cultural heritage institutions. He spent the last five years working for projects like One Laptop Per Child, Wikimedia and the GNU project. Samer Hassan (Spain/Lebanon) is an activist, researcher in artificial intelligence and assistant professor at the Universidad Complutense de Madrid. He is Co-Founder of the Comunes.org collective, an umbrella for initiatives such as Ourproject, Kune and Move Commons.